One of the most impressive debuts of the year for me, Joe Pug‘s “Nation of Heat” EP – which was released last month – is quickly becoming my album of the year so far. It’s not often that I’ll throw around Dylanesque comparisons, let alone twice in the space of two months. 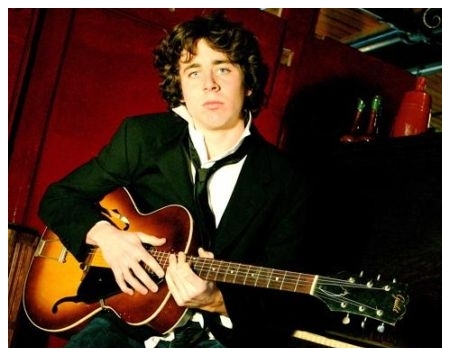 But following on from my “Month That Music Forgot” post back in May – where I featured the stunning “Tallest Man On Earth” – today’s featured artist, Joe Pug, also immediately recalls images of a young, bursting-at-the-seams Dylan. Heck, add into that hints of Woody Guthrie, Josh Ritter, and even some Springsteen. Just in case you haven’t realised it yet: I’m loving it. Pug: Well, certainly Dylan and Prine are huge for me. They might be obvious, but I think that’s okay. Because there’s something very fundamental about both of those guys that makes them accessible, so you can go off on a tangent of your own. They taught me that a song can be original in its logic or phrasing or spirit even while its using a structure or melody that’s been around for a hundred years. Steinbeck and Whitman are huge for me. Whitman explained once that poetry isn’t meant to confuse people. That trying to articulate your feelings as clearly as you can is cryptic enough as it is. You don’t need to fool anyone. You don’t need to prove to anybody that you know things that they don’t know. Because of course you do. So just try to say it as clearly as you can. Steinbeck, for me, embodies that ethos, whether he meant to or not. You see it most strikingly in The Grapes of Wrath when he begins that harrowing passage that begins, “And this I know…”. You’ll never read something so lucid. I suppose right now, that’s what I strive for. Okay. So Bob Dylan? Check. John Prine? Check. John Steinbeck? Check. Walt Whitman? Check. Seriously, this kid could not check more boxes with me if he tried. And these influences are easily seen. Joe Pug can turn a phrase like nobody’s business… at only 23 years of age, his lyrics sound like they come from someone twice his age. I want you to give my music away. The thing is, there’s no subsidiary of Viacom shoe-horning my latest single onto radio playlists. There’s no carefully worded advertisements assaulting you at the bus-stop. There’s no ringles. You heard about my music from a friend. Simple as that. Which means you listen to music because of its substance, not its convenience. And that’s precisely why I’m asking for your help. Think of some likeminded friends who haven’t heard my songs. Then let me know how many sampler CDs I should send you to give to them. So let’s help spread the word, shall we? I’ve included three songs below; the stunning lead track, “Hymn #101“, the EP’s scathing title track, “Nation of Heat“, and finally, the deliciously titled “I Do My Father’s Drugs“. If you like them, then spread the word to your friends about Joe Pug. Let’s get him out there. good stuff, yo – thanks for hipping me to Joe’s stuff! Thanks for stopping by! Yeah, there’s definitely a wealth of wisdom there in this kid… despite his only 23 years of age. Nice tunes Burgo… I like this guys style!